Many of the CFA Pipes and Drums musicians are multi-instrumentalists and enjoy creating all sorts of new facets to their Afro-Celtic sounds. The band members are all volunteer musicians in the SANDF Reserve Force and come from all walks of life. We have a few students, a few pensioners, banking officials, a travel agent, various big business representatives and even a winemaker amongst our members. In 2008 when Pipe-Major Imrie took over with six active members his vision saw the band grow from strength to strength. It can now boast firm ranks of 17 pipers and 10 drummers with a full learner group coming up through the ranks. 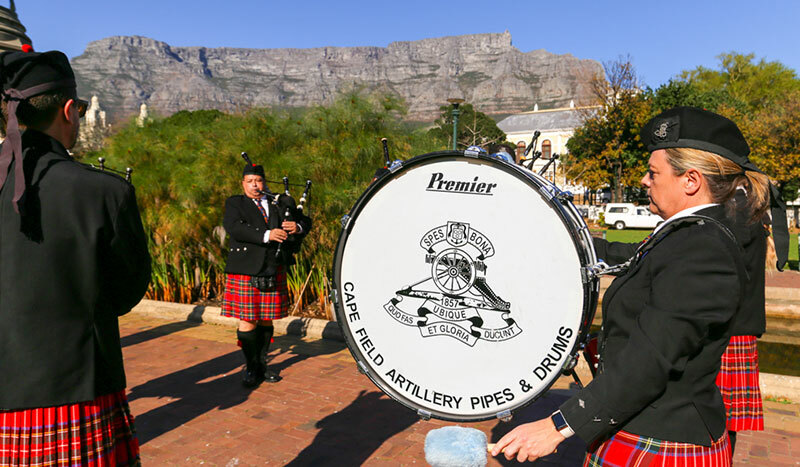 Whether on the concert platform or on parade Cape Field Artillery Pipes and Drums is proud to be there. The Royal Stewart tartan is the best known tartan of the royal House of Stewart, and is also the personal tartan of Queen Elizabeth II.